Free download PingPlotter latest version. 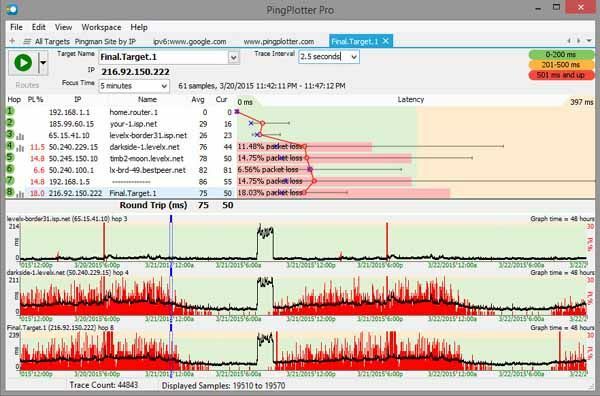 PingPlotter helps pinpoint network problems in an intuitive graphical way, and continues monitoring connections long-term to further identify issues. This powerful tool is easy enough for casual surfers, yet robust enough for the networking professional. Visualize the network path between your device and a final destination to quickly show whether problems are related to local networks, internet service providers, or something in between. Graphing latency and packet loss at every hop between your device and a final destination identifies network performance bottlenecks and helps find the source of problems faster. Gain insight into time sensitive problems by capturing the most recent ten minutes of network performance in the history graph. Standard and Professional editions both show more than ten minutes of collected data at a time. Set up two targets side-by-side to compare performance, monitor two servers at once, or perform ad hoc troubleshooting activities while monitoring another target long term.